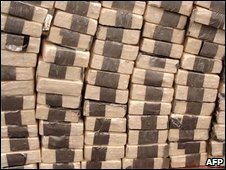 Guatemalan and US authorities have seized a makeshift submarine loaded with cocaine with a US street value of $200m (£120m). The submarine, which had 10 tonnes of cocaine on board, was stopped by the coast guard some 280km (175 miles) off Guatemala's Pacific coast. Four Colombians and one Mexican man on board the vessel were arrested. Guatemala is becoming an important transit point for illegal drugs moved north by Mexican trafficking cartels. These cartels are increasingly moving into neighbouring Guatemala in a bid to ensure safe supply lines following a crackdown launched by Mexico's President Felipe Calderon. The president has deployed more than 45,000 troops to fight drug gangs since he took office in December 2006. At least two other submarine-like vessels have been found by anti-drug patrols in the waters around Central America. The BBC's Jeremy McDermott, in Medellin, says drugs smugglers often use such makeshift vessels - constructed in steel and fibreglass - as they are difficult to detect using a conventional radar. Our correspondent adds that the vessels, which can cost up to $1m each, are often sunk after use.